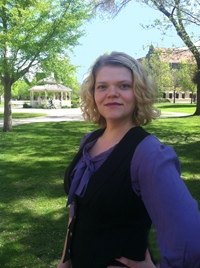 Andrea Wood is an Associate Professor of Film and Media Studies in the English Department, and an affiliated faculty member in the Women's, Gender, and Sexuality Studies program at Winona State University. Dr. Wood completed her BA at McGill University in Montreal, Canada and her MSc in English Literature at the University of Edinburgh. After taking a one-year hiatus from her studies to teach English in Tokyo, Japan, she returned to the United States and completed a PhD at the University of Florida. She was a Marion L. Brittain postdoctoral fellow at Georgia Tech before joining the faculty at Winona State. Dr. Wood is an interdisciplinary scholar with diverse research interests in transnational comics and animation, horror and science fiction film genres, digital media and fandom, and feminist and queer theory.